24 DIY Play Kitchen Ideas Making Miniature Pretties that Look Realistic! 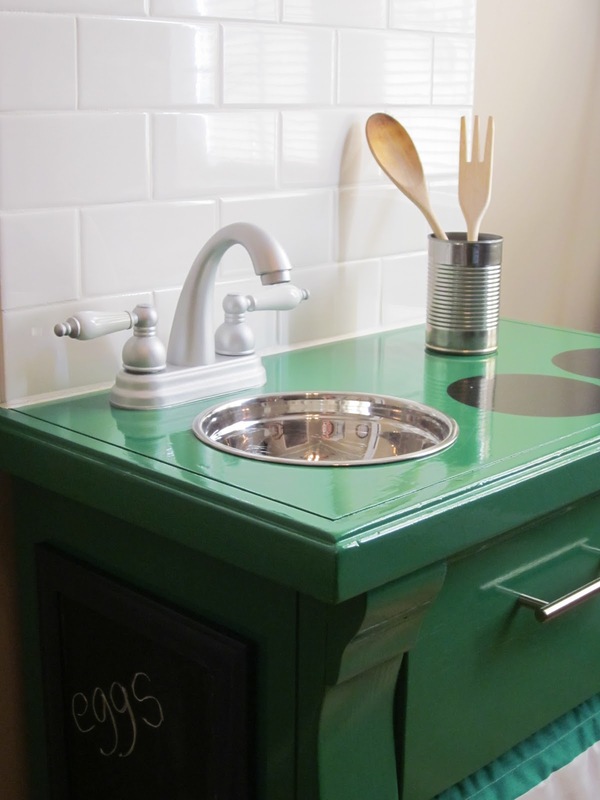 24 DIY Play Kitchen Ideas Making Miniature Pretties that Look Surprisingly Realistic! Home » DIY PROJECTS » 24 DIY Play Kitchen Ideas Making Miniature Pretties that Look Surprisingly Realistic! Looking at us preparing delicious treats, the kiddos often want to be a part of the kitchen affairs. And this is where putting together a play kitchen for them seems to be a must-make something. To get that done, here are 24 DIY Play Kitchen ideas making miniature versions of a formal kitchen. By utilising just two wooden cabinets, this exclusive play kitchen is built in the most inexpensive and easiest of the ways. The look of the kitchen is kept simple and light by putting just a couple of planters with succulents. This idea also features the concept of a small chimney placed over the stove which highlights the black and silver theme amazingly. The platform around the sink area is adorned by a marble patterned paper that contrasts the all black tone of the stove. The knobs used for the stove are original knobs that deliver the most realistic appeal. Have a look at the tutorial for a better understanding. Although the color scheme of this beautiful play kitchen is kept limited to neutral hues and goes for white majorly, the sink is worked up in a soothing grey. You have got a miniature fridge on the left of the play kitchen, while the right side sports a lovely stove having the oven underneath. The middle section is dedicated to the sink with a sparkling silver bar sink faucet from Lowe’s. The stove knobs and the burners add further details to the construction, marking the country-inspired kitchen with absolute minimalism. Head to the guide by Low Country Living to learn more about the idea. This idea features different customizations to the Ikea play kitchen, by adding a number of decor pieces to the setting along with the stove and sink. The top of the area is utilised to display two different planters and a big mug in between. The first shelf is used for the storage purpose and the items add to the formal vibe of a kitchen. A few utensils are also placed in the mid section of the area along with a small planter. You can also place some salt and pepper shakers just to make it look more real and proper and you can also opt for printed wallpaper on the back board. If you are looking to make a small and space friendly play kitchen for your little ones then this inspiration is a must try for you. Not much is done for the decor rather only a few pieces are displayed to create the proper kitchen vibe by placing a pan on the stove, some spatulas, a measuring cup and a mixing bowl. The sections for the stove and sink are divided in two small cabinets that flaunt the pastel green tone contrasting to the white for the rest of the area. For more ideas to add customizations, visit the link given below and create this easy and elegant play kitchen. Just with the help of two Ikea night stands and a little customizations, you can create this modern and funky play kitchen for the kids. The decor is dominated by the use of kitchen essentials in different colors that add the contrast to the neutral color scheme. The two drawers under the sink area are used to store more kitchen related stuff like baking gloves and fruits and vegetable baskets. The two cabinets are put together by placing a mosaic tile backboard and a table top that combines both the cabinets. Visit the link below, to have a better idea for the cabinets and accessories. This serene and elegant looking play kitchen idea is all about its lovely tint of pistachio that enhances the simple vibe for the setting. The cloth pieces hung in the interior add the different tones of colors beautifying the look even more. Only a couple of appliances are placed on the kitchen counter as the use of items is kept limited and the main part of attention is the gorgeous color scheme of the kitchen. Ana White is here yet again with an awesome plan for whipping up a play kitchen for your little one. The idea displays an all green and brown color scheme for the structure and a simple decor with just a small planter placed on the side. The rustic watering can used to store the wooden spatulas adds a farmhouse vibe to the setting. Even the fridge has got a sleek dowel attached to one side to allow to kiddos to hang hand towels or aprons. The cute design of the white and black stove knobs add a pop of brightness to the otherwise pastel prettiness of the kitchen. If you are looking to turn an old and simple looking table to a cute and elegant play kitchen with just a little effort and time, then this idea is your thing. By just a few changes, you can build your kid an all new kitchen area. Changing the paint of the table transforms the major part about the piece of furniture. The adding of the extended counter on one of the sides makes up for a little kitchen space where the kids can place their toy utensils and use the board as seating with a rod attached for hanging the multi-colored table mats and cloths. Start with your repurposing skills and turn an otherwise horizontal cabinet to a vertical play kitchen area for your kid by making the necessary changes in the structure. Shift the legs from the bottom to the sides and add a backsplash, install the sink and the stove. The storage space in the cabinet can be used to store the essentials or food items as in the inspiration that the kids can play with safely. Hook the initials of your kid’s name that gives the personal touch to the setting over the kitchen area that can be used to hang the toy utensils. Have a look at the link below. Got the old vintage dresser top that you just want to give away, here is an amazing inspiration by which you can convert that dresser to a mini kitchen for your little one which offers a huge amount of space and a whole lot of options. A huge focus is kept on the accessories that complete the look of the kitchen and make it a mini version of any formal kitchen. By placing breadboard, tea cups, kettles, toaster, sieves and etc. the setting is beautified. The bottom area is used for storing baskets and other kitchen items. Here is an antique yet elegant looking kitchen area featuring the pastel bottle green paint that compliments the white subway tile backsplash. A rustic looking steel can is placed for the wooden spatulas that adds the rustic appeal to the setting. One side of the kitchen is adorned with a chalkboard that can be used to write down lists, menus or just a sweet everyday message. A few more decoration customisations can be added by putting string lights, more colorful kitchen utensils and accessories can be used. Head to the below guide to have a better insight in the idea and work up with your versions of the same. If you are a person who loves colors and wants to build a place that adores the bright shades and hues then this idea is a must do for you. This vibrant and beautiful piece of prettiness features all the rustic and chic appeal that is perfect for any kid. Right from the bright orange toy blender to the eccentric red knobs for the stove, everything makes the interior gorgeous. A lot of kitchen appliances and utensils are kept in the space that make it the perfect mini kitchen. The shiny silver appliances also make it appear elegant and rustic. Visit the link below and have a better idea for this play kitchen. The surprisingly realistic designs and amenities offered by each of the DIY play kitchen ideas above is amazing enough to make your little ones develop a love for cooking the moment they get a glimpse of their miniature kitchens. Here’s a 40 Dollar DIY Barn Door All About Joining A Wooden Cut List Together! How Beautiful is This DIY Mirrored Nightstand Worked up From IKEA Wooden Nightstands?